There is nothing more frightening for a parent with a child that has Autism than the split second their child can be right by them and then they've disappeared. Eloping or wandering is something many children do but especially children with Autism. Melanie Vann, a counselor and mother of a young child with Autism talks about her experiences as a parent. She also discusses how her friends, family, and strangers have and can help people with special needs children. Education, compassion, ... See More and awareness are key especially when we hear about young children who have run off, are Autistic, and possibly non-verbal who are later found too late. 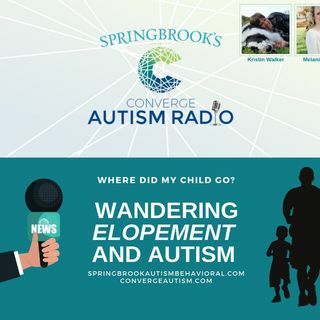 Please join us at www.convergeautism.com, whether you have Autism yourself, your child has Autism, or they don't so you can learn about this disorder and be a part of a society that reserves judgement and tries to help potential danger from happening in the life of a child.